The factory where the Twiglet was invented is being honoured with a plaque. The Peek Frean and Co building in Bermondsey, south London, was built in 1866 and was also responsible for creating the Garibaldi and bourbon. The area gained the nickname of "Biscuit Town" as a result, but the factory was closed in 1989 and now houses office units. Southwark Council's blue plaques are chosen by people from the borough. Among people there for the ceremony on Friday was former factory worker Madeline Jones, whose mother and grandmother had also worked there. 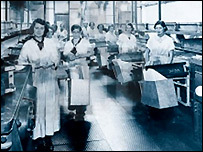 "I worked here packing custard creams, twiglets and cheeselets - families worked here for generations," she said. She told BBC London she had fond memories of her former workplace. "We used to dance to the music as we were packing the biscuits - we would eat a few as well as they were coming along, or buy a few cheap at the biscuit shop." The council is also launching a map of the area at the event on Friday, which will help visitors find out about its industrial and artistic past. It shows places like the Design Museum, the Unicorn Theatre and Bermondsey Antiques market. Southwark Councillor Howard Barnes said: "The factory that brought the Twiglet and Garibaldi into the world undoubtedly deserves to be recognised with a plaque. "Bermondsey is a developing area that is steeped in history and, by voting, the people have decided that the Peek Freans factory is an important part of it."